Gili Lankanfushi is my favorite sand-between-your-toes resort in the Maldives, an easy speedboat ride from the international airport in Male (so you can arrive at any hour). On boarding their boat, you're handed a bag in which to store you shoes ... and the logo on the bag says, "No News, No Shoes." 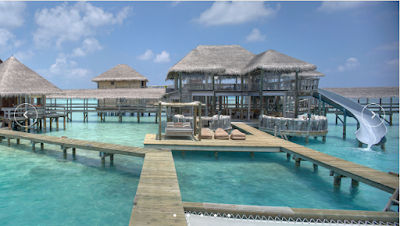 Truly a place to relax and enjoy the crystalline waters of the Maldives. Their 4BR Private Residence has just become available for December 27 - January 5. If you've been meaning to make plans for a family vacation but haven't gotten around to it yet, you will love Gili Lankanfushi. Perfect for families, your children will enjoy the waterslide while you can all enjoy at this elegant yet casual resort.